Natural Sugars vs Added Sugars Part 1: What’s the Difference? As a society, we are constantly bombarded with the idea that sugar is bad for us. The term ‘sugar’, however, can be broken down into two main categories that may change our perception and understanding of its existence. Natural sugars are found in two main forms: fructose and lactose. Fructose is the type of sugar found in fruit whereas lactose is the type of sugar found in milk. Both are naturally occurring sugars that do not need to be actively avoided. The dairy and fruit products that contain these types of sugar contain so many other vitamins and nutrients that are important for our bodies. In addition, naturally occurring sugars tend to have a smaller effect on blood sugar as opposed to added sugars. FOR EXAMPLE: A medium-sized apple contains 19 grams of sugar. All the sugar is naturally occurring, and apples are also good sources of fiber and vitamin C.
Added sugars, simply put, are everything else. If a food contains sugar that is not naturally occurring, it has been added. Added sugars go by many names and are found in all sorts of foods. One of the most common and easily recognized added sugars is high fructose corn syrup. Added sugars are frequently found in candy, desserts, sauces, soda and other sweet foods and beverages. While added sugars are okay in moderation, they contain no essential nutrients and increase calorie intake. The 2015-2020 Dietary Guidelines for America recommend that no more than 10% of daily calorie intake should come from added sugars. FOR EXAMPLE: 12 oz of a cola soft drink contains 39 grams of sugar. There are no other nutrients in the soda that are beneficial to the body. For many individuals, the beginning of a new year can be a stressful time as they attempt to set food-related goals for the upcoming months. Many people acknowledge that they want to eat “healthier”, but they fail to create a realistic and attainable goal of what that means for them. As an older adult, it can be more difficult to choose a resolution due to health conditions and diet restrictions. However, this does not mean that you cannot set food-related goals. Here are some resolution ideas for you to try during 2019! There are many connotations of the word “healthy”, and it is important to decide what that concept means to you. On one hand, eating healthy might mean following a strict diet to adhere to a doctor’s order or a specific health condition. On the other hand, eating healthy possibly means consuming a wide variety of foods when and where you choose. What is healthy for one is not necessarily the best option for another. Regardless of your situation, it is important to personally define the term “healthy” to have a strong relationship with food. Try writing your own definition! If you cook for yourself, are you constantly preparing the same recipes? If you have your food prepared by your senior care facility, do you usually opt for the alternate hamburger? Why not try something new this year? Eating new foods can be intimidating, but you may find a new favorite dish. Do not be afraid to make suggestions to the kitchen staff and food service director at your facility. You can also ask family and friends for new recipes to try. A new year is a great time to pick up a new hobby! For many people, cooking or baking is a great creative outlet. There may even be opportunities at your facility to learn how to cook! Talk to your activity coordinator to see if your facility offers cooking classes. If they don’t, ask if it would be a possibility in the future. You can also learn from family and friends or seek out classes offered in your community. For many people, a new year means a new diet. There are many different fad diets nowadays, and often they are tiring, restrictive and ineffective. If you find yourself caught in this cycle, it might be time to go back to the basics. A variety of fruits, vegetables, whole grains, low-fat dairy products and protein foods is a great place to start. Eating a combination of these food groups in moderation is the way to ensure that you are consuming all the nutrients that your body needs! Dietitian-approved menus are the best way to deal with senior care home residents who suffer from dysphagia. Dysphagia, or difficulty swallowing, is a common concern for older adults – at least 15 percent of seniors suffer from this age-related dysphagia. Dietitian-approved menus for seniors are designed to address dysphagia, as any disruption in the swallowing process can lead to serious health issues. Food menu program that include recipes created by registered dietitians can provide significant benefits for adult care facility residents living with dysphagia. Proper nutrition can be a concern for older adults without dysphagia. So, when swallowing difficulties arise, getting seniors to eat a well-balanced diet is often quite challenging. As a result, malnutrition affects many seniors who have difficulty swallowing. Lack of appetite and less enjoyment in eating are common issues, and dysphagia often leads to weight loss. 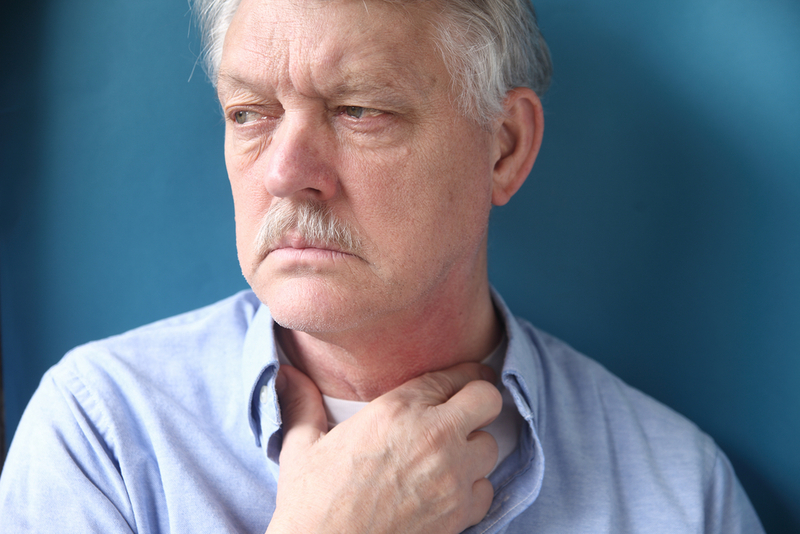 What’s more, dysphagia increases the risk of aspiration pneumonia caused by food entering the airway. Aspiration pneumonia is a life-threatening condition, particularly for older adults with additional health concerns. Treatment for dysphagia often includes working with a speech therapist to learn exercises and techniques to improve the ability to swallow. In many cases, mealtime changes are also recommended. Dietitian-approved menus are designed to address many different senior health concerns, including dysphagia. When medical professionals recommend changes in food preparation, the recipes can be easily and quickly adapted for easier eating. Older adults who have difficulty swallowing frequently need their food mashed or pureed, and a food menu program makes it easy to adjust the consistency. Adult care facilities provide nutritious pureed diet programs for seniors who have difficulty swallowing. The problem is that older adults often find these options to be unappetizing – which means many seniors turn to less healthy foods like ice cream and pudding when they get hungry. Dietitian-approved menus can solve this problem. Seniors find recipes that use fresh, seasonal ingredients — instead of prefabricated foods – to be more flavorful and appetizing. And, when you exchange prepackaged institutional containers for artfully-arranged, delicious pureed foods, appetite and mealtime food consumption both increase – and older adults get the nutrition they need to stay healthy. Does dysphagia affect the seniors living at your adult care facility? The Grove Menus program is a user-friendly, cost-effective food menu program with dietitian-approved recipes designed to address the unique health concerns older adults face. The Grove Menus meal planning program contains hundreds of delicious and nutritious recipes, each of which can be easily modified for seniors with health conditions like dysphagia. In addition, our suite of food menu program tools can cut costs and reduce waste related to food production at your adult care facility. For more information about the Grove Menus meal planning system, or to schedule a free demonstration of our dietitian-approved menus, contact us today. Food menu programs feature all kinds of healthy recipes for seniors – including creative snack ideas. Serving between-meal bites that are high in vitamins, minerals and fiber helps ensure that older adults get the calories and nutrients they need each day. Nutritional needs change as we age, and many seniors are better able to meet their dietary requirements by eating smaller amounts of food more often. Simple, healthy snacks are a great way to round out your assisted living facility food menu program. Seasonal fruits make for delicious, nutritious snacks. Try slicing up some strawberries, apples and bananas. Mix together with blueberries, raspberries and diced kiwi, then toss with a bit of honey and orange juice for a healthy treat. Granola bars aren’t always considered healthy snacks for assisted living facility residents, but homemade versions can be. To pack yours with nutrition, stir together rolled oats, crisp rice cereal, chopped nuts and seeds with nut butter and maple syrup, then bake. Turkey wraps are low in calories and high in protein, making them a perfect snack choice for seniors. Spread honey mustard on a whole grain tortilla wrap, add sliced turkey, tomato, lettuce and shredded cheese, then roll up tightly and refrigerate before cutting. Waffles aren’t just for breakfast — they can be healthy snacks. 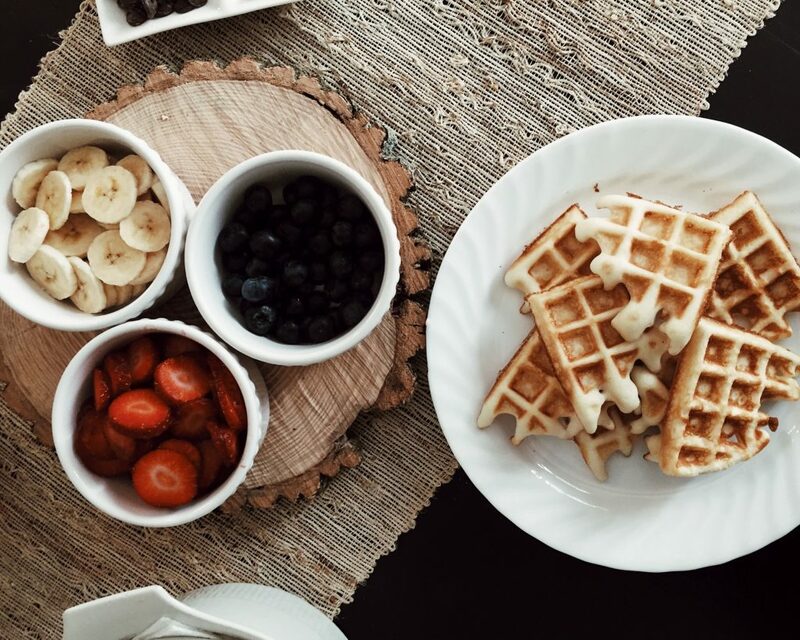 Top mini whole grain waffles with low-fat cream cheese and blueberries or raspberries for a snack time treat your senior residents will love. Sugar snap peas, baby carrots, strips of red pepper and cucumber slices offer seniors much-needed nutrients – and serving them with hummus dip makes for an even healthier snack. Juicy, crisp apples are a senior favorite at snack time – and paired with nut butter, they’re particularly tasty and nutritious. Peel the apples for easier eating, and slice for dipping. Tiny finger sandwiches are appealing to seniors and, with the right ingredients, they can be a healthy addition to your assisted living facility food menu program. Try serving tuna or chicken salad on rye, or nut butter with banana slices on whole grain bread. Avocados are naturally nutrient-dense, so snacks featuring this superfood can be healthy for older adults. Spread slices of avocado on crackers or lightly toasted bread for a delicious assisted living facility snack. Strawberries are appetizing on their own, but who doesn’t love them with a little chocolate? Serve strawberries with low-fat or fat-free pudding for a sweet and healthy snack time treat. Homemade popsicles are refreshing, healthy snacks for seniors. Blend non-fat plain Greek yogurt with fruit puree – try strawberries with bananas or blueberries with raspberries — and pour into popsicle molds, then freeze overnight. If you would like even more fresh ideas for healthy snacks, the Grove Menus software system – with a suite of user-friendly food menu program tools – features hundreds of delicious, dietitian-approved recipes designed to meet the nutritional challenges of older adults. Meal and snack planning for seniors is much easier and more cost-effective with Grove Menus. For a complimentary, no-pressure demonstration of how our food menu program can benefit your assisted living facility, contact us today. An assisted living facility menu planning program provides recipes for healthier senior dishes – including burgers. Hamburgers are traditionally dripping with calories and fat, but nutritious versions can be just as tasty. In honor of National Burger Month this May, we’re sharing our top menu planning program tips for building healthier burgers for seniors. For many seniors, beef is a must for burgers – ground turkey or chicken just isn’t the same. Using lean or extra lean ground beef is best but, to make hamburgers healthier, replace half the meat with finely chopped mushrooms. The hearty texture goes well with ground beef, and mushrooms add a big nutritional punch. Seasonings like salt, pepper and dried herbs boost flavor without adding calories or fat. To pack in more taste and nutrition, consider making burger patties with mix-ins like barbecue sauce, steak sauce, minced onion or even shredded zucchini. 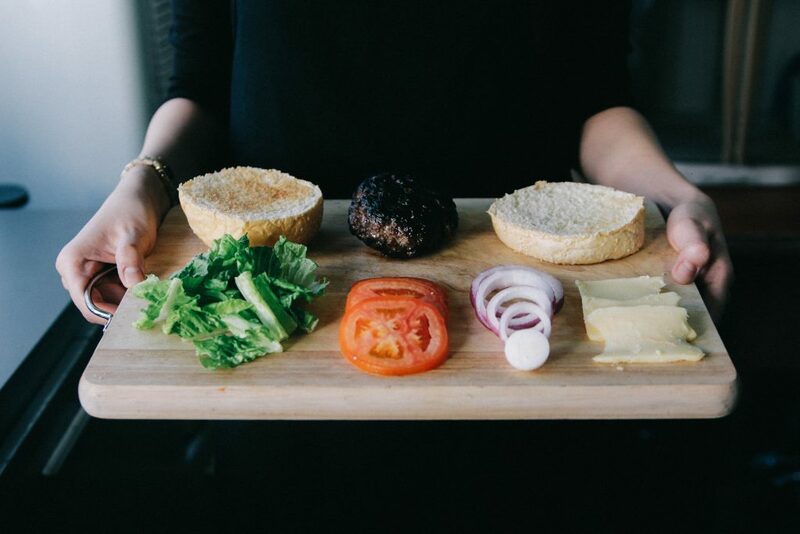 When it comes to healthier burgers, serving size is important. Seniors can safely enjoy hamburgers on a regular basis, but older adults don’t need supersized servings. Make slider-sized burger patties instead, using about 3 to 4 ounces of meat for each. To some, a burger isn’t a burger without the cheese – but many cheeses are high in calories and fat. Processed cheese slices are the usual choice, but low-fat shreds or ultra-thin slices of block cheeses make for healthier burgers. White buns don’t offer much in the way of nutrition. Whole grain buns are much healthier and using half the bun to make open-face burgers is a great way to cut calories. Or, switch out the regular white bun for a 100 percent whole wheat English muffin. Another way to make burgers healthier – and more flavorful — is to top them with a pile of veggies. Leafy greens like spinach or kale work well, or pile on some cabbage slaw. You can also try sautéed mushrooms, caramelized onions or roasted red peppers. Mayonnaise is high in fat and calories, and ketchup is filled with sodium and sugar. To make healthier burgers for seniors, use these condiments in sparingly, or switch them out for mustard, hummus, guacamole or salsa. Building healthier burgers to celebrate National Burger Month is easy when you use the Grove Menus software system. Our menu planning program features hundreds of delicious and nutritious dietitian-approved recipes as well as an integrated suite of user-friendly tools that facilitate food service operations. To learn more about the Grove Menus software system, or to schedule a free, no-pressure demonstration of how our assisted living facility menu planning program can help you serve healthy, hearty meals while saving time and money, contact us today.